Igor Mirović, President of the Government of the Province of Vojvodina, opened the conference “Vojvodina in 2019” by pointing out that indicators for economy are today positive in Vojvodina, but that ahead of the Government, led by him, there was still much work to do to provide better life standard for all citizens. “There are many challenges and much work lying ahead of us in 2019, in order to go hand in hand with good results and economic indicators registered over the past few years”, said President Mirović. 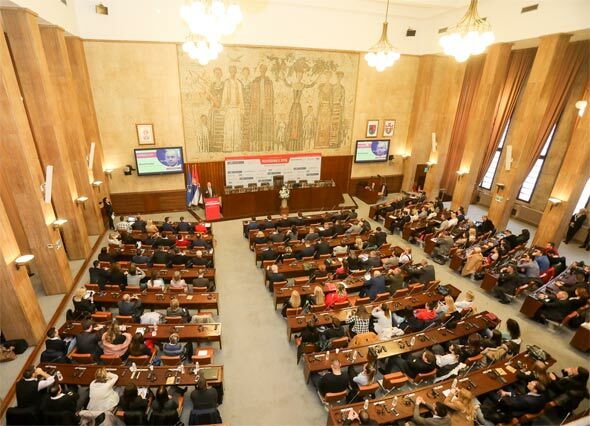 He emphasized that the conference “Vojvodina in 2019” was an opportunity for experts from many fields to converse within panels and offer their perspectives on how they see successful AP Vojvodina during this year. “When it comes to the entire country, we have good indicators and it is necessary to maintain this ambience. Therefore, I expect from today’s conference to bring suggestions and useful discussions on how to continue in the same direction in future, and how to make Vojvodina a promised land”, said Speaker of the AP Vojvodina Parliament Ištvan Pastor in his introductory speech. Robert Čoban, CEO of “Color Press Group“, said that the conference’s objective was to show through panels what lies ahead of Vojvodina in this year, and he announced that the fields for discussion would be economic currents, Euro integrations, energy stability, challenges of viable development, culture and sports. The conference started with a panel entitled “Vojvodina, European region”, during which the speakers were Oana - Cristina Popa, Ambassador of Romania, Gordan Bakota, Ambassador of Croatia, Tomaš Kuhta, Ambassador of the Czech Republic, Ognjen Bjelić, the Province’s Secretary for regional development, international collaboration and local self-rule, and Aleksandar Simurdić, on behalf of the European Movement in Serbia. Throughout the course of five panels, the participants spoke about economy, viable development, sports and culture. Mayors from Vojvodina’s towns presented their anticipations and plans in front of the audience: Dušanka Golubović, Mayor of Sombor, Miloš Vučević, Mayor of Novi Sad, Saša Pavlov, Mayor of Pančevo, Čedomir Janjić, Mayor of Zrenjanin, and Pavle Markov, Mayor of Kikinda. The conference’s participants were also: Ivan Đoković, the Province’s Secretary for economy and tourism, Vladimir Galić, the Province’s Secretary for urbanism and environmental protection, Vladimir Batez, the Province’s Secretary for sports and youth, Dragana Milošević, the Province’s Secretary for culture, public information and relations with religious communities, Nikola Žeželj, director of Vojvodina’s Development Agency, Predrag Mihajlović, president of Vojvođanska banka Executive Board, Boško Vučurević, Vojvodina’s Chamber of Commerce, Dragoljub Zbiljić, “Energotehnika Južna Bačka”, OK “Vojvodina”, Goran Čabradi, Zelena stranka, Mihail Mateski, “GreenTech”, Mato Zubac, Association of inventors, Mr Milan Đukić, president of RK “Vojvodina”, Bogdan Kuzmanović, president of Management Board of the Institute for crop growing and vegetable farming “NS Seme”, Nenad Pagonis, sports club “Pagonis tim”, Nemanja Vučurević, hockey club “Vojvodina”, Nataša Pavlović, Touristic Organization of Vojvodina, Dr Zoran Đerić, Managing Director of the Serbian National Theatre, Vukašin Grozdanović, OPENS 2019, Vesna Burojević, director of the “Sava Šumanović Gallery”, Šid, Valentin Vencel, Novi Sad’s Theatre – Ujvideki sinhaz. The conference was held under the supervision of the Province’s Government. The conference’s friends are: “Vojvođanska banka”, “Energotehnika Južna Bačka” and “Grand Motors”. 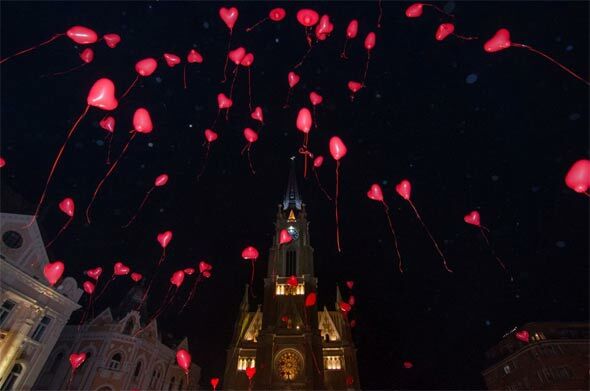 By releasing heart-shaped balloons into the air, the youngest citizens officially opened the third “Festival ljubavi” (“Love Fest”) at Liberty Square. The choir “Zvončići” from Novi Sad performed on the stage the most beautiful children’s songs and gave the sign to release balloons into the air. Afterwards, the visitors enjoyed the greatest hits by the band “Red Hot Chili Peppers” and their tribute band. “Love Fest” will take place from February, 3rd until February, 24th at Liberty Square and several more locations in the city. Citizens of Novi Sad, as well as tourists, will have the opportunity every day to enjoy various programmes at Liberty Square – such as performances of acoustic bands, performances of artists who play classical music, dance evenings, and performances by children’s vocal groups. As one of the greatest attractions of the previous festival, the flower wall this year also embellishes Liberty Square. “Fuzetea Flower Wall“ will be adorned by natural flowers, and with the word “love” written in 30 international languages. Again this year, at the wooden houses various products and handicrafts will be offered, whereas the visitors will have the opportunity to take a love-filled coach ride and take photographs in front of several “love doors”, „Orbit Kissing Point“ and a retro wall with picture frames. Which love stories are hidden by art works, the visitors can discover via guided tours in the “Matica Srpska Gallery” and the “Pavle Beljanski Memorial Collection”. The marathon of Serbian classics, alongside conversations with authors, actors and their descendants, will be available at the Museum of Contemporary Art of Vojvodina. Within the festival, there will also be organized a free-of-charge tourist tour – love history of Novi Sad. Organizers invite citizens of Novi Sad to take part in a humanitarian activity to garner means for a keyboard which will be donated to the Daily Care Centre for children and youth, within the Social Care Centre, which will enable the protégées to practice and perform. Their performance is scheduled to take place at the festival on February, 13th. The festival’s friends are: “Fuzetea”, “Orbit”, “Zaječarsko pivo” and the BIG Shopping Mall. “Christmas Village at the Temple” was held at the plateau in front of the Saint Sava’s Church, from January, 4th until January, 28th 2019 and during the event, in front of the Church and inside the Crypt, more than one hundred musical performers, children’s and church choirs, and various vocal groups performed. The youngest embellished a unique construction – Christmas Singing Tree – where children’s and church choirs from the entire Serbia performed. At the main stage, among others, the performers were: Sanja Ilić and “Balkanika”, Sergej Ćetković, Aleksandra Radović, Lena Kovačević, Dušan Svilar, “Neverne bebe”, Snežana Đurišić, Marinko, Nikola and Marko Rokvić, Neda Ukraden, and many others. In the wooden houses located at the plateau in front of the Temple, the visitors had the opportunity to find different presents, handicrafts, souvenirs, decorations, traditional specialties, and every day they also had the opportunity to take a coach ride around the Temple. The youngsters had the opportunity to take a ride on the Merry-go-round. This year again, the biggest attraction was a hay pool where the birth of Jesus Christ was symbolically shown. On the Christmas Eve and the Christmas Day many citizens were present, and on January, 7th again the breaking of a Christmas bread “česnica” was organized in front of the Saint Sava’s Church, with blessings of His Holiness the Serbian Patriarch Irinej. At the plateau in front of the Saint Sava’s Church, Orthodox New Year was welcomed, and the citizens who gathered enjoyed the performance of the “Lexington” band and the fireworks. More details about the event, all the photographs and video clips of activities, can be found on the official Internet site www.bozickodhrama.rs, a Facebook page – Božićno seoce kod Hrama, and the YouTube channel Božićno seoce kod Hrama. The event “Christmas Village at the Temple”, in collaboration with the Saint Sava’s Church, and under supervision of the Ministry of Justice – Directorate for cooperation with churches and religious communities, the City of Belgrade and the Vračar City Municipality, was organized by companies “Color Media Communications“ and “Ninamedia“. Friends of the event are: the Serbian Orthodox Church, the Saint Sava’s Church, Ministry of Justice – Directorate for cooperation with churches and religious communities, Youth Theatre “Dadov”, “Erste” bank, PDM “AgroFruit”, “Raiffeisen Bank”, “Mapei”, “Lidl Srbija”, “Next sokovi”, ”Orbit”, “Deksi ko”, “Neretva komerc”, Association of bakers, and many others. 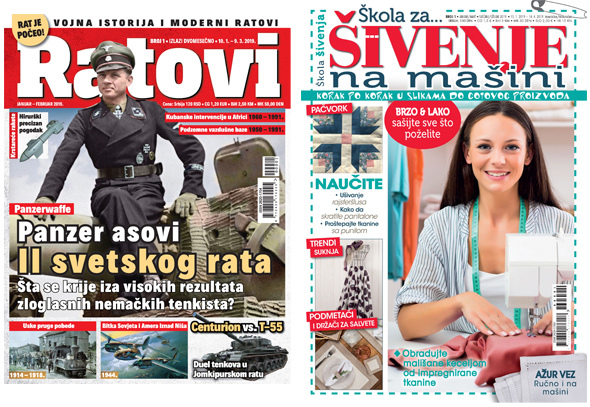 New CPG magazines: “Ratovi” and “Škola za šivenje na mašini”! The new magazine entitled "Ratovi” (“Wars”) is intended for all fans of military history, and its focus will be on the history of warfare and army, with a special review of the period starting from the mid nineteenth century, and lasting until the end of the twentieth century. Serbian experts and historians were brought together to work on the magazine, but also many licensed associates were joined. In addition to its focus being well-known disputes, “Ratovi” magazine also deals with less known battles and wars, events taking place behind the front lines, military and political figures, articles about military equipment, weapon and warfare tactics. “Color Press Group” publishes the magazine according to a license granted by the company “Extra Publishing” from the Czech Republic. The magazine is a bi-monthly (six issues annually), and is sold at the price of RSD 120 (1.20 EUR, 2.5 KM, 50 DEN). “Škola za šivenje na mašini” (“School for machine sewing”) is a unique magazine in this region, intended for all creative persons, and primarily for beginners who wish to conquer this skill, and do not possess time to attend a course. Step by step, with illustrations, and owing to our pieces of advice – in a quick and simple way, they will get a finished product. “Color Press Group” publishes this magazine according to a license granted by the Italian company “CIGRA2003 S.R.I.”. The magazine is published quarterly (four issues annually), and is sold at the price of RSD 150 (1.5 EUR, 3 KM, 50 DEN, 15 KN). Traditionally, during the Christmas holiday season, the company “Color Press Group” and the “Lazin salaš” restaurant organized lunch at the Daily Centre for the Homeless in Novi Sad. 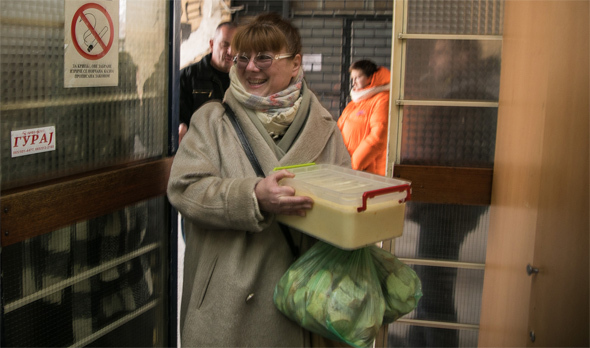 The shelter’s protégés, in addition to a hot meal, received clothes garnered during the festival “Novosadski Winter Fest”. For the second time, the event entitled “Božićno seoce kod Hrama” (“Christmas village at the Temple”) was solemnly opened on Friday, January 4th at the plateau in front of the Saint Sava’s Church. His Holiness, the Serbian Patriarch Irinej at the opening said that he believed that the event “Christmas village at the Temple” would bring some joy to many citizens of Belgrade, especially to children. “I greet you in peace and with Lord’s mercy, wishing you to spend the holiday ahead of us as Orthodox Christians, to pray to the newborn savior together to give us love, peace and unity, to the City of Belgrade, our people, and all people in the world, particularly those people who have good will”, said the Patriarch, who had previously in the Temple’s Crypt granted Christmas presents to children, organized by “Versko Dobrotvorno Starateljstvo”. Solemn opening started with performances of the Representative Orchestra of the Serbian Army’s Guard Unit and the Police of the Republic of Serbia. Sanja Ilić and “Balkanika” performed on the main stage and the audience was thrilled with their excellent concert. The Serbian Parliament’s Speaker Maja Gojković was present at this solemn opening as a guest. Rich programme on the plateau in front of the Saint Sava’s Church will continue over the forthcoming days. Today, starting from 5PM at the “Singing Christmas Tree”, the choir “Vrapčići” will perform, the choir “Orlić” will perform at 6PM, whereas Lena Kovačević and Filip Žmaher will perform on the main stage as of 8PM. On Christmas Eve, January 6th, burning of oak tree branches will be organized on the plateau in front of the Temple at 4PM, whereas Bdenije will start at 5PM. During the same night, just ahead of Christmas, a concert of folk and traditional music will be organized on the main stage from 7PM, with performances by Snežana Đurišić, Marinko, Nikola and Marko Rokvić, followed by the RTS Orchestra. On Christmas Day, January 7th, starting from 11:30 a traditional breaking of “česnica” bread will be organized at the plateau in front of the Temple, organized by the Bakers’ Union. “Božićno seoce kod Hrama” will last until January, 28th. During the event “Božićno seoce kod Hrama“, at the plateau in front of the Saint Sava’s Church, a large number of performers will be on the stage, including: Sergej Ćetković, Aleksandra Radović, Lena Kovačević, Dušan Svilar, “Neverne bebe”, Nikola Grbić Grba and “Trinitus bend”, Viki Miljković, Aco Pejović and Sanja Đorđević, and many others. In addition to the musical programme, visitors will have an opportunity to watch various theatre performances, exhibitions and films. Last year, in front of the Temple and in the Crypt, more than one hundred musical performers, children’s and church choirs, vocal bands, actors and dance groups appeared on stage. The youngsters every night embellished a unique construction – “Singing Christmas Tree” – where children’s and church choirs from all over Serbia performed. 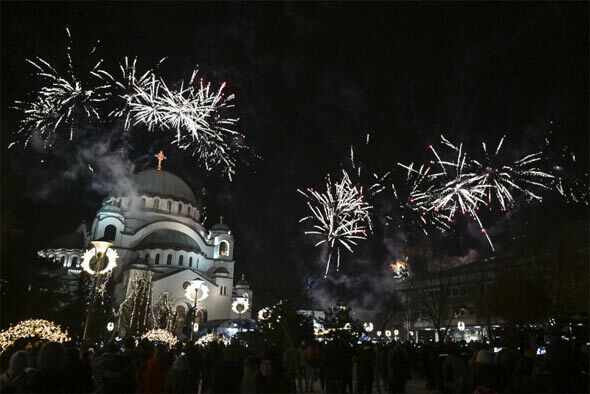 The idea was parallel with the wish to unite all holidays that take place during January, and to celebrate them on the same, unique location, the plateau in front of the Saint Sava’s Church, with blessings from His Holiness the Serbian Patriarch Irinej. The organizers’ wish was to offer to citizens of Belgrade and tourists, who visit the city of Belgrade and the Saint Sava’s Church, a unique event intended for the youngest, but also for older visitors. The event includes everyday musical programme and adjoining activities, with the objective for the event “Božićno seoce kod Hrama“ to grow into a traditional one. Day after day, visitors will enjoy performances of children’s and church choirs on a very unique construction – the Christmas Tree, they will have an opportunity to take a ride in a coach around the Temple, to enjoy musical and drama programmes on the stage, to find various presents in wooden houses, handicraft, souvenirs, decorations, traditional specialties, and to attend many other activities. The event “Božićno seoce kod Hrama“, in cooperation with the Saint Sava’s Church, and with support from the Ministry of Justice – Direction for cooperation with churches and religious communities, the City of Belgrade and the Vračar City Municipality, is organized by companies “Color Media Communications“ and “Ninamedia“. The event’s friends are: the Serbian Orthodox Church, the Saint Sava’s Church, the Ministry of Justice – Direction for cooperation with churches and religious communities, the youth theatre “Dadov”, “Erste banka”, PDM “AgroFruit”, “Raiffeisen banka”, “Mapei”, “Lidl Srbija”, “Nekst sokovi”, “Orbit”, “Deksi ko”, “Neretva komerc”, Bakers’ Union and many others.